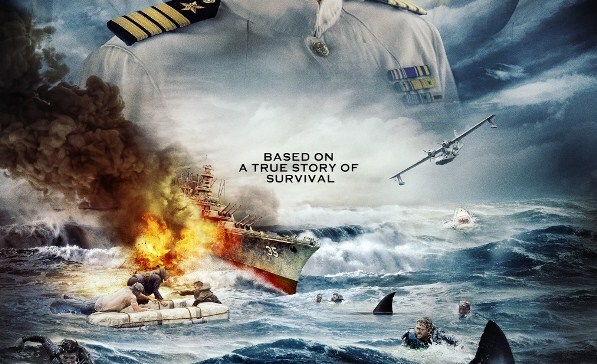 Award-winning actor Nicolas Cage (National Treasure, Con Air, Face/Off) is starring in a historical film about the sinking of the USS Indianapolis that's scheduled to hit theaters this coming September in the United States. Titled USS Indianapolis: Men of Courage, the film is a war drama that chronicles the tragic sinking of the cruiser USS Indianapolis by a Japanese submarine during World War II at the Philippine Sea. The event is widely considered as the worst naval disaster in U.S. history. When the ship sank, it took 300 men with it down to the bottom of the sea. Of the 900 men who were stranded on the surface of the sea, only 317 survived. The rest died from dehydration, exposure, saltwater poisoning, and shark attacks. The survivors were spotted by chance, four days after the ship sank, by a war plane on routine patrol. All in all, around 800 good men perished in the disaster. In the film, Cage portrays Captain Charles Butler McVay who was court-martialed after the incident. He was convicted of "hazarding his ship by failing to zigzag". Of the 350 navy ships lost by the U.S. Navy during World War II, only one ship's captain was court-martialed: Captain McVay of the USS Indianapolis. Starring alongside Cage in the film are Tom Sizemore (Saving Private Ryan), Thomas Jane, Matt Lanter, Brian Presley, Cody Walker, Emily Tennant, Callard Harris, Mandela Van Peebles, Weronika Rosati, and Yutaka Takeuchi. The film was directed by Mario Van Peebles. USS Indianapolis: Men of Courage isn't the first film to be made about the disaster in the Philippine Sea. Director Robert Iscove made a movie in 1991 called Mission of the Shark: The Saga of the USS Indianapolis which was also inspired by the tragic event. Stacy Keach played Captain McVay while Cary-Hiroyuki Tagawa played Commander Mochitsura Hashimoto.